Spinach is a leafy vegetable grown since ancient times. 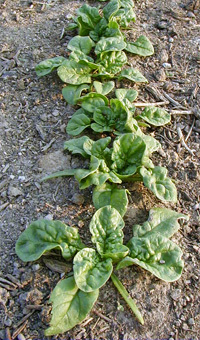 Spinach produces rosettes of leaves. The cartoon character Popeye attributed his great strength to eating spinach — maybe justifiably, since this leafy vegetable has a very high iron content. Spinach (Spinacia oleracea) is a hardy annual related to beets and Swiss chard that has been used by humans for a long time.Native to southwest Asia, it was first cultivated in Persia (Iran) over 2000 years ago and used by the Chinese in the 6th century. Arabs brought it to the Spanish around the 11th century, and it had spread to the rest of Europe by the 14th century. It was brought to the Americas with the early colonists. The plant grows a rosette of dark green leaves, but under warm temperatures and long daylength it bolts, or goes to seed. The leaves may be eaten fresh or cooked. There are two basic types of spinach with either smooth leaves or crinkly (savoy) leaves. The smooth types are normally grown for freezing and canning because they grow faster, yield more and are easier to clean. 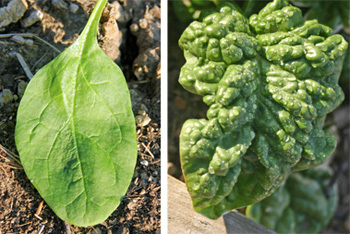 Spinach may have smooth leaves (L) or crinkly (savoy) leaves (R). The savoy types are preferred for the home garden and fresh market use because they look and taste better, keep longer and have less oxalic acid (which can interfere with the utilization of calcium or magnesium in the diet) than smooth leaf types. Semi-savoy types have lightly crinkled leaves. 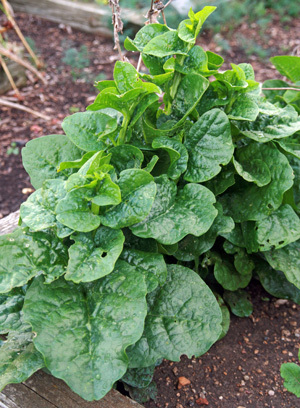 Some of the newer varieties of spinach, such as ‘Indian Summer’ and ‘Olympia’, are slow bolting (seed-stalk development is slow even as day length increases), so these may be desirable for summer crops. Older varieties without this trait are best used for spring or fall plantings. 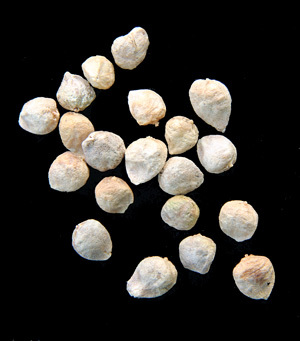 The old rule of thumb was that prickly-seeded varieties were best for spring and fall, while round-seeded varieties were better for summer, but this is no longer true as new varieties of slow-bolting, round-seeded types have been developed. ‘Avon’ is a semi-savoy type for early spring planting. It has large, slightly crinkled, dark green leaves and has resistance to blight and mildew. (44 days to harvest). Varieties with resistance to blue mold were developed at the UW-Madison in the late 1950’s – including ‘Badger Savoy’ and ‘Wisconsin Bloomsdale’ – but these do not seem to be available anymore. 1-2 inches apart after the soil is warm, and the multiple seedlings from each seed cluster should be thinned when the seedlings are large enough to handle. Pinch off the ends of the stems of large plants to encourage new growth. There are a number of other tropical plants that are spinach substitutes, including Malabar spinach (Basella alba), water spinach (Ipomoea aquatica), and Chinese or African spinach (Amaranthus gangeticus). Plant spinach from seed when conditions are suitable. Spinach seed does not remain viable for very long, so purchase seed packaged for the current year. Spinach is a cool-season crop, best grown in spring or fall. You may be able to keep spinach seed under optimal storage conditions for a couple of years, but germination rates will probably be much lower. 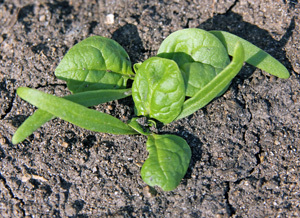 ‘Olympia’ spinach seedlings, with their long, narrow cotyledons and rounded true leaves. Spinach is a cool-season crop that should be planted in early spring, about 4 weeks before your area’s average date of last frost. Ideal spinach weather is 50 to 60°F. 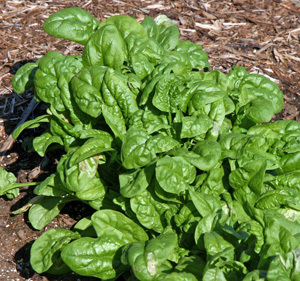 Spinach does best in well-drained soil rich in organic matter, and will tolerate partial shade. Plant seeds 1-4 inches apart and about ½ inch deep. If you use the closer spacing, thin when the leaves touch, when the plants are about 2″ tall, using the tender leaves for salad greens. Make sequential plantings about 2 weeks apart to continue harvesting spinach through the summer. Choose bolt-resistant varieties for later plantings. But even slow bolting types will not remain vegetative for very long, so each planting’s productive time will be short. Leaf quality declines when the reproductive cycle begins with seed-stalk formation. 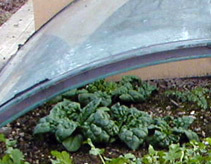 Extend the growing season for spinach with a cold frame. A fall crop often tastes better than the spring crop because the temperature cycle of warm to cool weather is more predictable. 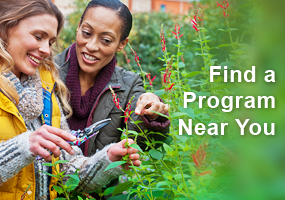 Plant the fall crop in mid-August for a late-September (or later) harvest. Extend the season by covering the plants during really cold nights or grow in a cold frame. I have been able to harvest spinach in late December many years after growing the plants in a temporary cold frame (created from a curved glass pane and board ends set on my raised bed) when the fall weather has not been extremely cold. You can also try a “winter” crop, planted in late September, that will grow a little before going dormant for the winter. Alternatively, just cut off the leaves of the plants of your fall crop, leaving the roots and growing point intact. These plants may overwinter to grow a new crop of leaves in the spring. In colder areas or severe winters, covering the plants with mulch may enhance their survival. Some varieties, such as ‘Bloomsdale Longstanding’, are hardier than others, and are more likely to survive the winter. 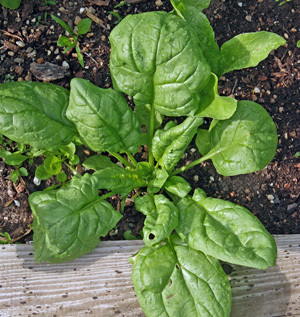 Spinach grows best in rich, moist but well-drained soil. 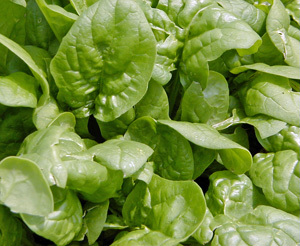 Grow spinach in rich, moist soil with good soil aeration. Poor, dry soil only encourages spinach to go to seed. 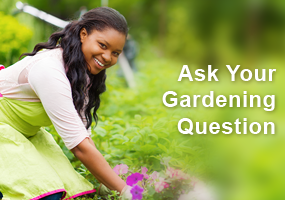 It does best with uniformly moist soil, but try to avoid splashing water so the leaves won’t get so dirty. You can mulch around the plants to help retain moisture and keep soil off the leaves. Spinach is a weak competitor, so keep the spinach bed weed-free. 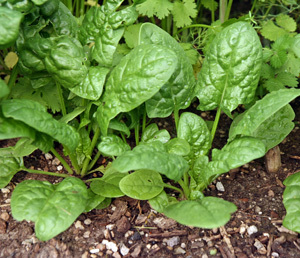 Pull tiny weeds or cut off larger ones at ground level to avoid injuring the shallow roots of the spinach plants. Spinach is a heavy feeder. 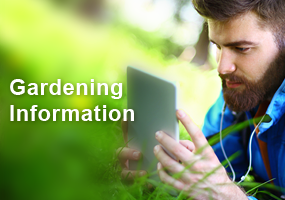 Fertilize before planting and at midseason to stimulate growth and yield. This is more important in spring when nitrogen is less available to plants in the cold soil. Apply a sidedressing when plants are about 2 inches tall. Use about ¼ pound of 5-10-5 fertilizer per 10 feet of row. If the leaves begin to yellow, add additional nitrogen. 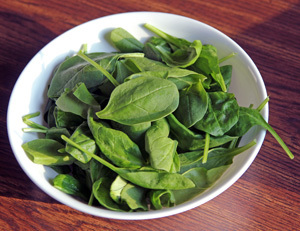 There are few insects or diseases that bother spinach. Aphids may occasionally infest plants and spinach leafminer may be problematic in some areas. Aphids can be controlled by removing infested leaves or with chemicals if numerous. Minor infestations are often destroyed by a variety of natural enemies, such as green lacewings, lady beetles and parasitic wasps. Aphids may also be washed off the leaves with a vigorous stream of water. Spinach leafminer is a fly that lays its eggs on the undersides of the leaves. The maggots burrow into the leaf and create conspicuous trails as they eat their way through the leaf. Remove leaves with eggs or mines, but don’t spray chemicals since they are ineffective once the insect is inside the leaf. To prevent leaf miner damage put floating row cover on after thinning. But use supports, such as hoops, to keep the fabric off of the plants. 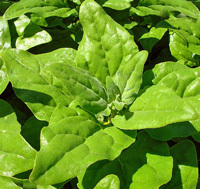 unlike other plants which tolerate row cover placed directly on the plants, the tender spinach leaves can be abraded if the fabric brushes back and forth in windy conditions. Slugs can also be a problem in very moist situations. Do not mulch around the plants. 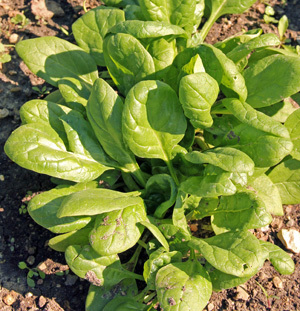 Spinach is susceptible to rust, but most varieties are rust resistant. Occasionally leaf spots, either Cercospora leaf spot or Anthracnose, may develop on the upper sides of the leaves, then fall out to form holes. Fungicides will control these diseases. Choose resistant varieties if downy mildew is a problem in your garden. 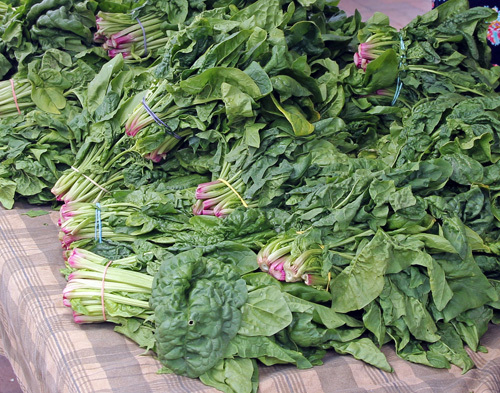 Bunches of spinach for sale at a farmers market. You can remove individual leaves periodically starting when the plants have at least 6 true leaves. Or harvest the entire plant at maturity. This is probably the best harvesting method in the spring , or when a central stalk begins to appear. Cutting the plants off at the soil line will keep the harvested leaves cleaner than if the whole plant with its roots is removed. In the fall, removing the outer leaves only will allow the plant to continue to grow and produce more for continued harvest. Loose leaf spinach for sale at a farmers market. Wash the leaves thoroughly in plenty of water to eliminate the grit that sometimes sticks to the leaves, especially the crinkled types. 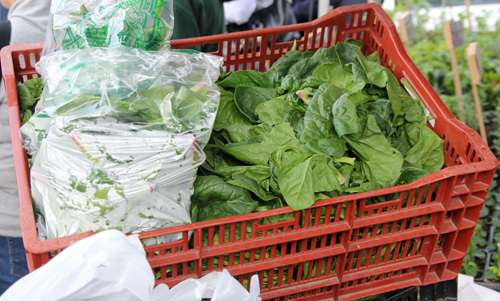 Fresh spinach can be refrigerated up to one week. The leaves can also be frozen, canned or dried. Spinach is great in salads. Nothing beats a salad of tender young spinach leaves you’ve grown yourself (other than maybe your own garden-fresh lettuce). There are many possibilities for creating a unique spinach salad, such as by adding a bacon-dripping dressing and chopped, hardboiled egg, or combining the leaves with strawberries and walnuts lightly dressed with a raspberry vinaigrette (or orange segments, sliced red onion and pecans). Spinach is equally delightful cooked. Try lightly sautéing it in garlic-infused olive oil and serve with a spritz of balsamic vinegar and a few pine nuts. Add chopped spinach leaves and cannellini beans to chicken soup for a different taste. Or mix with cooked pasta, dried tomatoes, Kalamata olives and grated Asiago cheese for a quick dinner. Spinach is an important ingredient in a number of traditional dishes, such as spanakopita, the Greek spinach and feta cheese pie and many Indian dishes. It’s even added to pasta to create green noodles. In Florence, Italy, spinach was considered a nobleman’s delicacy, so today “Florentine” usually denotes the inclusion of spinach in a recipe. There are hundreds of recipes for Florentine dishes using fish, chicken, pasta and vegetables. Spinach is one of my favorite veggies. Just reading this makes my mouth water. I succession plant it every year but never thought of mulching and overwintering it. I may try that this fall!